Anyone can be a blog. At least that's what I'm told. Just get a topic, write about it often, find some followers, lead an interesting life and you're set. Sure - easier said than done. Recently I read two books about bloggers and saw "Julie and Julia" the movie. The books were random selections, the movie intentional. I was so taken with the concept that I vowed to radically change my mindset and dedicate myself to what I love most, writing and grandchildren. How hard can it be? In the movie Julie vowed to blog daily and to make 524 recipes in 365 days. Now that's dedication. I figure if she can do it so can I. After all I have more years on board, which hopefully means more wisdom and surely means more experience. Let's start with the wisdom part. 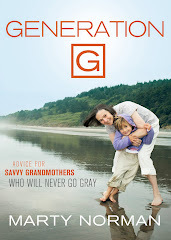 Already I know writing a blog a day is too big a goal for this grandmother of five. Wisdom 101 has just kicked in. So I'm setting a goal of a minimum of one blog a week with a maximum of two, with permission to skip a week here and there for R&R. I think I can handle that. Giving myself permission to set limits limits is a big key to success, so I'm already on my way. Now for the experience. Previously the queen of multi-tasking, I find it's easier nowadays to concentrate on one or two things and pack the other things away till later. Days are fairly quiet at my house now, though balancing husband, career, grandkids, mom, and friends sometimes keeps me hopping. Surely adding one more thing to the mix shouldn't be too hard. So on your mark, get set, go. Generation G is now in session. Keep your fingers crossed. You'll know I'm anyone when I call myself a blogger.